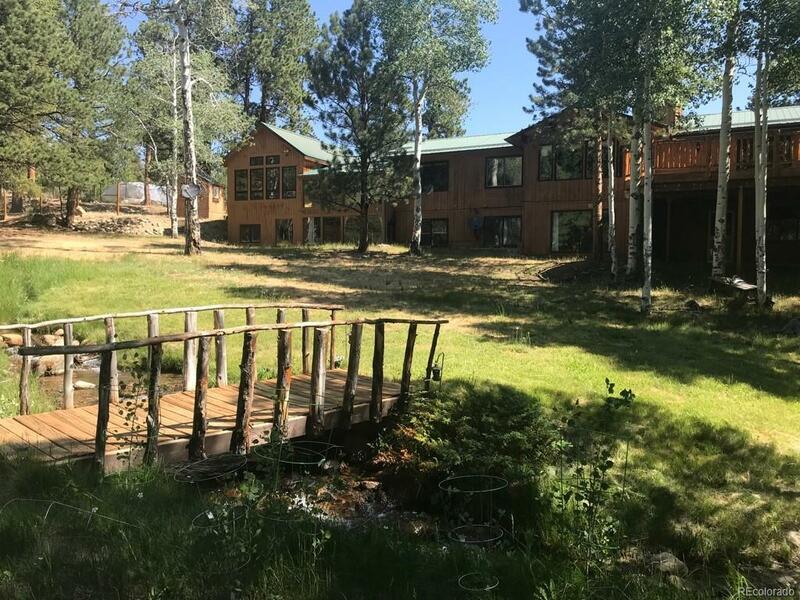 Large beautiful mountain home on an absolutely stunning 5.05 acre site with over 400 feet of year round creek flowing through the property! Perfect mixture of aspen and pine trees throughout the property with 3 acres of fenced yard with entry gate. The huge open living area on the main floor has a large handsome rock fireplace as the centerpiece of the Great Room and the room flows outside to a massive deck with built in hot tub all overlooking the creek and grounds. Full kitchen remodel in 2018 with new refrigerator, granite countertops, sink, faucet, tile and more. Large master suite with private kitchenette and jetted tub all overlooking the beautiful grounds and it has its own laundry room! Downstairs boasts a separate living area with kitchenette, multiple bedrooms all with scenic views of the creek and surrounding beauty. Separate heated guest cabin down by the creek! Property does allow for horses. Community pond and National Forest just a short walk away!